There is relatively little evidence at the moment that tDCS can lead to improvement in real-world activities. The closest we have got so far is in military contexts like spotting threats such as snipers. Researchers have used immersive video games to train soldiers to respond when they see something that might be a threat – tDCS seems to make people a little better. In my lab, the major concern I have is that I might trigger a seizure. A seizure results from over-excitable brain circuits, so adding more excitability with tDCS could be dangerous. I would not allow anyone to take part in my experiments if they have a family history of epilepsy, or if they have had excessive amounts of drink or drugs in the day before the experiment as these are also risk factors. I am also worried that younger people, whose brains is still developing, might also be using tDCS without proper supervision. There are too many unknown factors in how tDCS affects the brain for it to be safe for unsupervised use, and I think we should be very cautious even in research labs. From an older post, but I found it in a tweet from Halo Neuroscience‘s Senior iOS engineer, Rich Lowenberg @richlowenberg. We met Halo Neuroscience back in May, 2014. My sense is we may be hearing more from them soon (though it’s just a hunch based on recent media mentions). If you’re in the San Francisco area, they are recruiting for a TES (transcranial electric stimulation) ‘Hand Strength Study‘. It makes the brain work better—a wide range of potential effects from accelerating learning to improving body movement control […The] field is a big new area—not just sensing things in the brain or ‘reading’ it, but sending waves into the brain and ‘writing’ to it […] Nobody believed it was real! We didn’t either. Until we tried it. 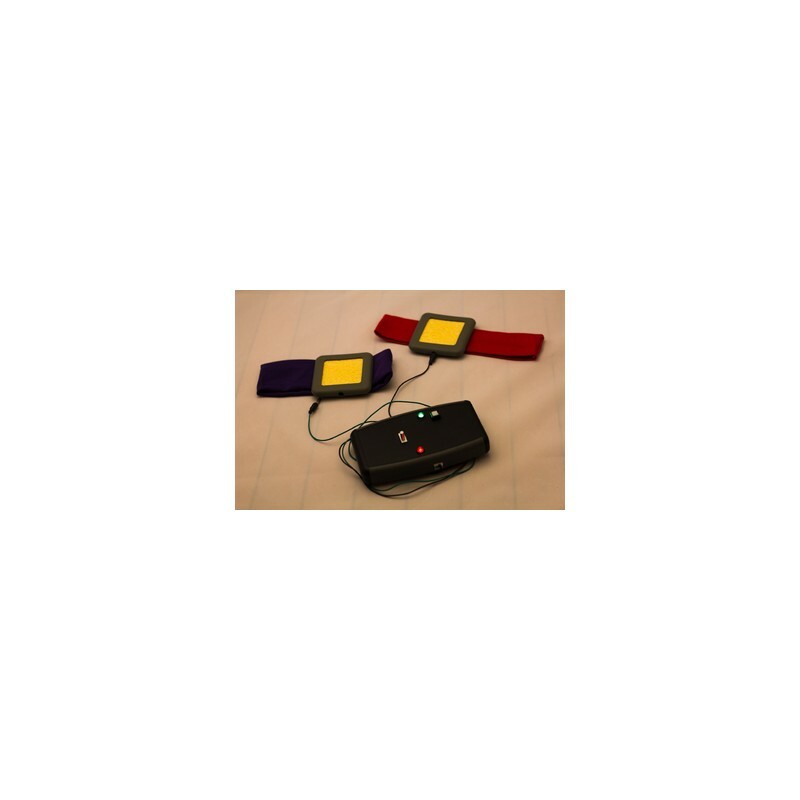 Halo uses a version of the popular transcranial direct-current stimulation (tDCS) method, which involves “priming” or “inhibiting” brain cells’ firing patterns by sending low levels of electricity through electrodes in certain scalp areas. This makes particular brain cells more or less likely to fire, therefore targeting brain activity toward certain performance standards. From a study published earlier this year that collected responses from 265 career scientists whose work involves tDCS. Researchers’ assessment of the efficacy of tDCS in clinical and enhancement contexts. Data represents distribution of responses (%) for each category, see legend. The cautious approach to use of tDCS is also reflected in the low ratings for efficacy of its use to enhance normal functions. The tDCS research community appears well aware of current limitations and the need for future research to address those. The appearance of enthusiastic articles in the media and online suggest that these cautious views are frequently not being communicated clearly to the public. Researchers must make their views about the limited evidence of safety and efficacy clearly when speaking with the media or communicating with the public. I had the pleasure of discussing tDCS with article-author Amy Dockser Marcus. She’s put together a very clear picture of where we’re at with DIY tDCS at the moment. I agree that Brent Williams is a great example of someone in the DIY community lighting the way towards safe and ethical home-use of tDCS. I draw attention to this section of the article because it will be of special interest to regular readers. I find it very interesting to note that this letter addressed to “members of the DIY tDCS community” from concerned researchers happens to be under review for publication a few weeks prior to the FDA Workshop that will address the use of “non-invasive brain stimulation medical devices” (emphasis mine). Unless representatives from the likes of Focus, Thync or Halo Neuroscience show up to represent their devices, I think it very unlikely that the ‘DIY’ community will be represented (though Thync is certainly positioned apart from the DIY community there are obvious overlaps in interest). I signed up for the webcast. Assuming the webcast software actually works, I hope to observe a reasonable discussion between intelligent persons that finds nothing of note to be alarmed about. Still, Dr. Hamilton believes some home users may not fully recognize that professional research in the field is largely done in people with brains “whose network has been altered and whose functions have been disturbed by or changed by injury.” Promising data gathered about neurostimulation on someone who has had a stroke, for instance, doesn’t necessarily apply to someone with “a normal intact system,” he says. Researchers also haven’t studied possible long-term impacts of repeated use of tDCS by healthy people. There is some preliminary research raising potential concerns that when neurostimulation improves one brain function, there can be losses in other areas. Assessing the risks and benefits of the technology may differ depending on whether someone is healthy or ill.
Dr. Hamilton is one of a group of scientists and clinicians working with tDCS for medical applications who have written a letter aimed at members of the DIY tDCS community that raises some of their concerns. The letter is under review for publication by an academic journal. I would only add that while Dr. Hamilton’s work with tDCS for the most part centers around aphasia (stroke) and pain, my sense of tDCS studies coming out of the science community is that it’s trending towards research with healthy individuals. Using transcranial direct current stimulation, we tested whether stimulation of left lateral prefrontal cortex had discriminate effects on language and memory conditions that rely on executive-control (versus cases with minimal executive-control demands, even in the face of task difficulty). 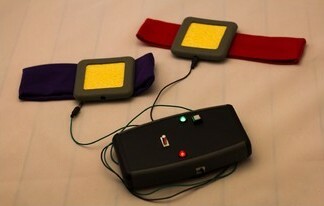 Participants were randomly assigned to receive Anodal, Cathodal, or Sham stimulation of left lateral prefrontal cortex while they (1) processed ambiguous and unambiguous sentences in a word-by-word self-paced reading task and (2) performed an n-back memory task that, on some trials, contained interference lure items reputed to require executive-control. Across both tasks, we parametrically manipulated executive-control demands and task difficulty. Our results revealed that the Anodal group outperformed the remaining groups on (1) the sentence processing conditions requiring executive-control, and (2) only the most complex n-back conditions, regardless of executive-control demands. Together, these findings add to the mounting evidence for the selective causal role of left lateral prefrontal cortex for executive-control tasks in the language domain. Moreover, we provide the first evidence suggesting that brain stimulation is a promising method to mitigate processing demands encountered during online sentence processing. [Update 20151104] Have asked via Twitter if there was additional (to their study PDF) science to verify these, well could you call them claims? Will update this post as information emerges. 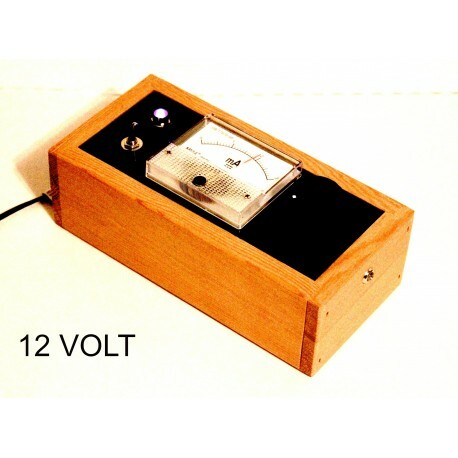 @DIYtDCS You got it! Neuromod research on new level. Industrial data leads to new insights/capabilities & improved tech across the board. I haven’t seen any word of this on their site or Twitter, but it appears Thync is set to launch new ‘vibes’. It’s also possible that because I’m on their mailing list, I’m part of a marketing test. You’ll recall that a ‘vibe’ is a desired outcome from a setting on their hardware. Thync launched with the ‘Calm’ and ‘Energy’ vibe. 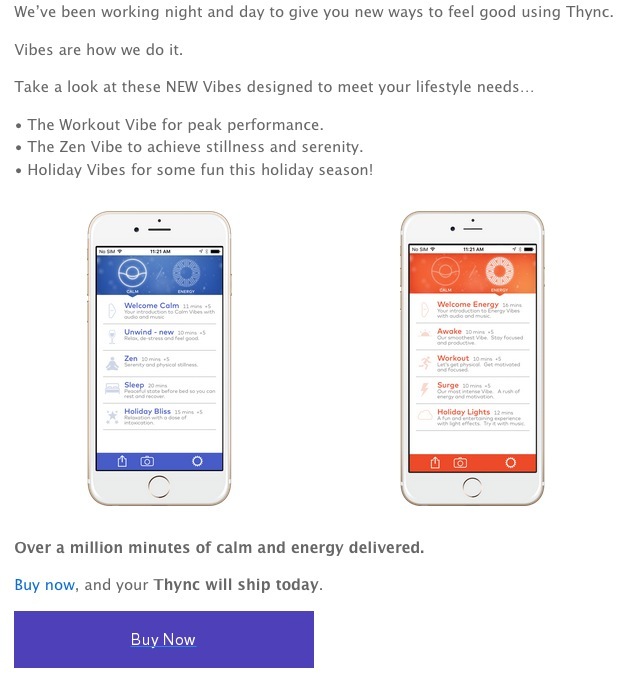 The email announces the ‘Workout Vibe’, the ‘Zen Vibe’ and the ‘Holiday Vibe’. I would assume each Vibe represents a unique waveform? Was there additional science as well or based off previous study? @DIYtDCS Interesting… of course, the app tracks use! No doubt some fascinating data emerging, especially as new Vibes come online. Thync and Fisher-Wallace looked at in this CBS News segment.